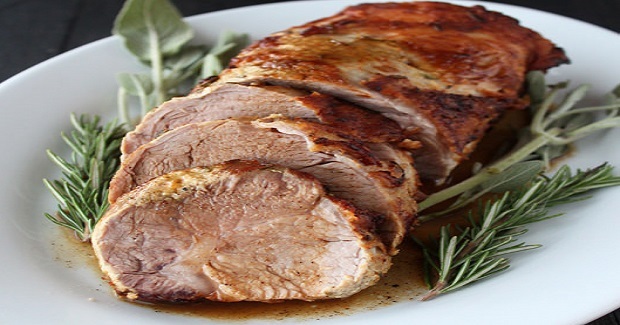 Ginger Lime Pork Loin Recipe - Gutom Na! Posted on Wednesday, October 19th, 2016 at 3:28 am. In a small bowl or glass measuring cup, combine the soy sauce, vinegar, 1 tablespoon oil, lime zest, lime juice, ginger, cumin, chili powder, salt, and pepper. Rub the soy mixture over the pork, cover, and marinade in the fridge for at least 3 hours, or overnight. Heat the remaining 2 tablespoons of oil in a large ovenproof skillet over medium-high heat. Add the pork loin, saving any leftover marinade, and sear until golden brown on all sides, about 2 to 3 minutes per side. Cover the pork with any leftover marinade before placing in the oven. Transfer the pan to the oven and roast for about 40 minutes, or until a thermometer inserted into the center of the meat reaches 145°F. Transfer the pork to a cutting board and tent loosely with foil. Let rest for at least 5 minutes before slicing into about 1/2-inch thick rounds.